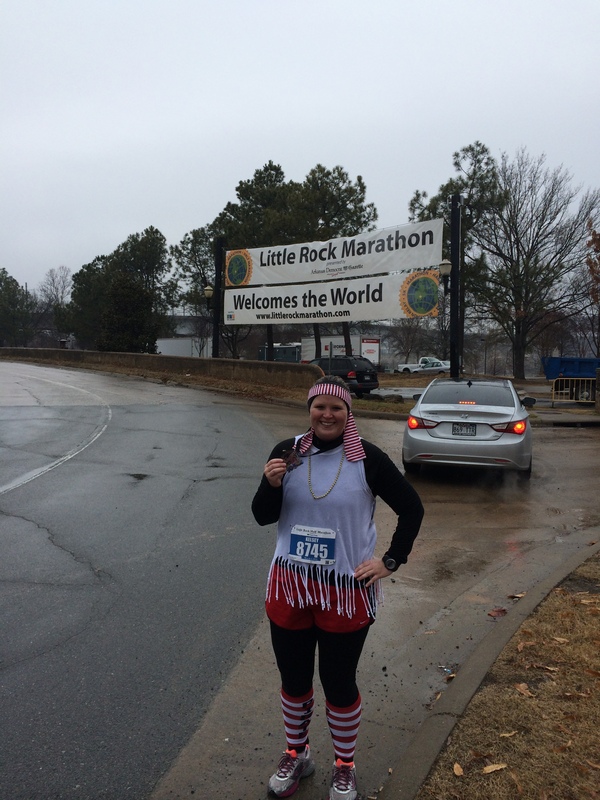 When I began my quest to run a half marathon in all fifty states, I knew for sure that the Little Rock Marathon would be my Arkansas race. I had read so many race recaps on this particular race and it just looked like a fun time. They are known for their full marathon medals but their half looked fairly sweet as well. East Tennessee suffered a massive ice storm in mid-February and it continued for a good long while. The school system that I teach in was shut down for over two weeks. I pitched the idea of going to Arkansas to run this race to my Daddy and he agreed to make the trip with me. We left early on Saturday morning and made the 9 hour drive to Little Rock. 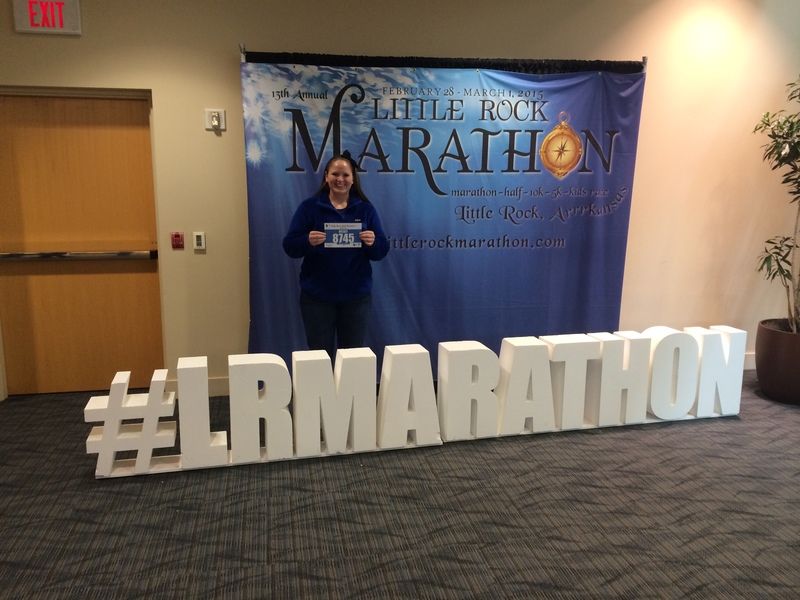 We had chosen to stay in North Little Rock (across the river) to save money on a hotel and we were fortunate enough to find a steal of a deal that was less than a four minute drive to the start line. You cannot beat that. The expo was very well organized and the volunteers were some of the friendliest I have met. They had several themed stations set up for photo opportunities including a massive pirate ship in the center with real pirates. My Daddy had never been to an expo before and was blown away by the fact that people were selling a pair of socks for 10 dollars. It was quite the experience. 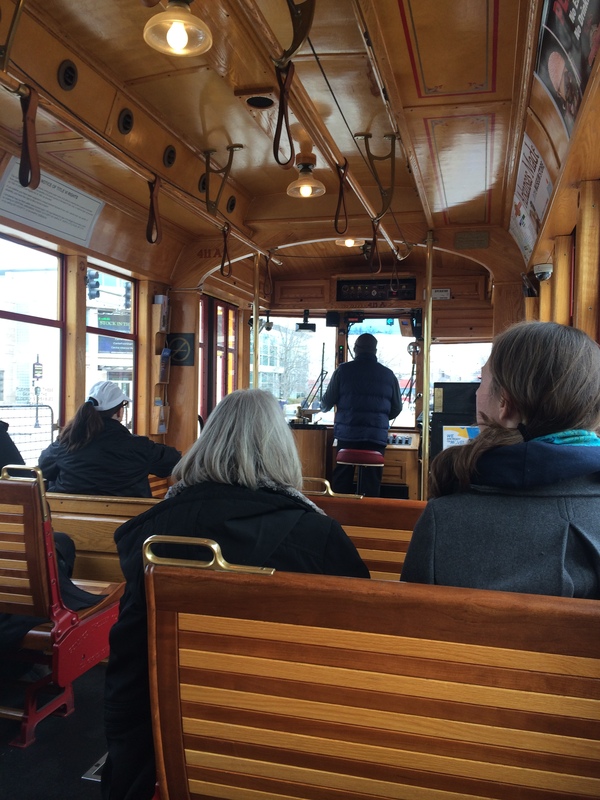 After the expo we took a cable car ride around Little Rock to learn the history. I’ve never seen a cable car in real life so I felt like a real city girl riding around in it. 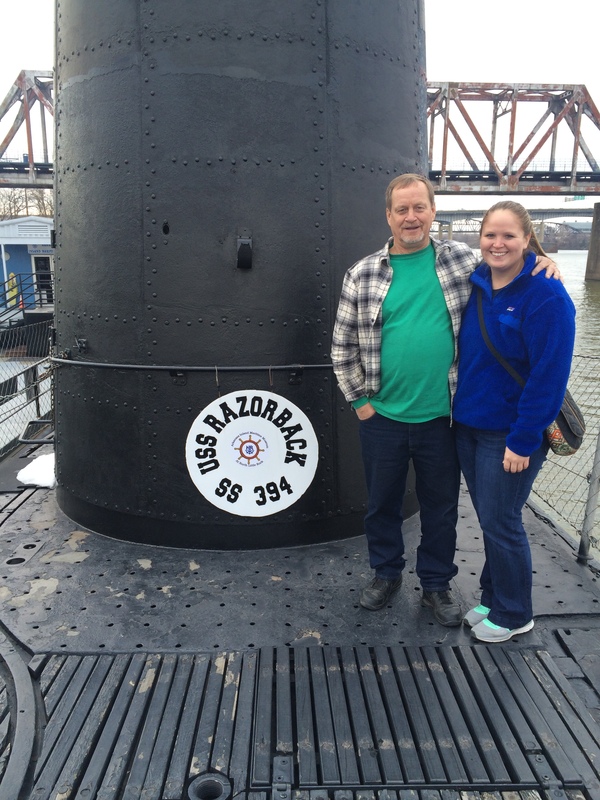 The tour guide noted that the USS Razorback was very close to where we were and suggested going to tour it so we took his advice. 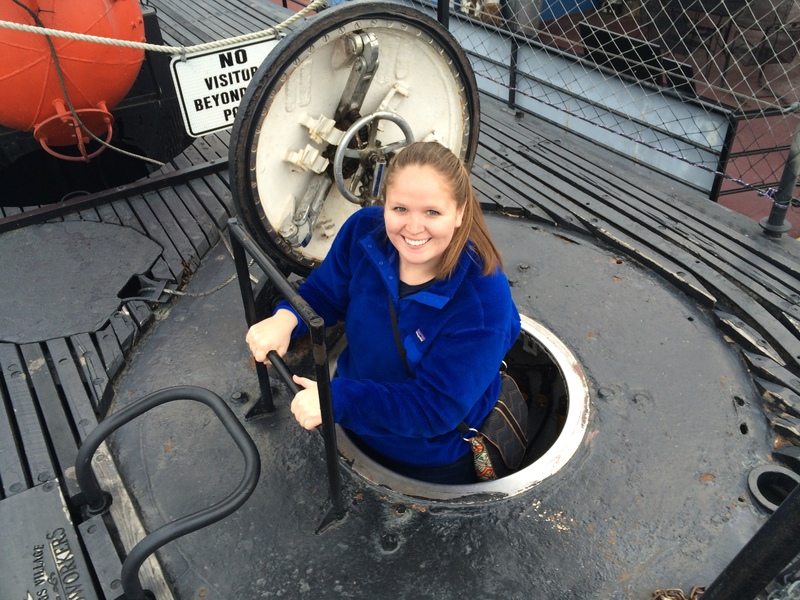 My father is former military and likes to see things that relate to military history so he was excited about touring a submarine. It was only about 7 dollars for an hour tour of it and the tour guide was very knowledgeable about the sub and all the history that it holds. I’ll admit that I did get claustrophobic during a few parts of it. I would advise anyone to check it out if they are ever in the area. We spent the rest of the day lounging in the hotel and found a nearby Cheddars restaurant for a pre-race meal. I don’t “test” out meals very often prior to running but usually chicken and a starch work well for my belly. We even splurged and had a massive cookie/ice cream dessert. Thankfully Arkansas is an hour behind my usual time zone so by the time 8pm rolled around I was ready for bed. I had made a makeshift pirate costume to run in for Sunday but looming rain forecasts had me worried if I would be able to wear it. Race morning came and I woke up before my alarm rang. I felt rested but a little nervous. This was supposed to solely be a training run and my only goal was to run in less than 3 hours so that I would be forced to go at a super easy pace and take multiple walk breaks. It was drizzly on race morning when we ventured to downtown and found a parking spot. I was able to meet up with the Half Fanatic and Marathon Maniac group and get a picture taken prior to walking to the start line. Once near the starting corrals I made a last minute decision to jump in line for the portapotties. I finished right as the race started and my Daddy was super concerned that I was missing it but I assured him that since my corral was so far behind the start that I would have plenty of time. I was right. The race itself was fantastic. There were people everywhere and all the fellow runners that I met were super encouraging and nice. With a light rain sinking into our skin, it was hard not to just laugh about it. All of the miles were very clearly marked and you could see them in the distance. My biggest complaint early on in the race was a handcycle that had either stopped for a break or just fell behind. He was screaming at participants to move out of his way and was downright rude. He literally would run straight into the heels of people which had to hurt. Obviously it was harder for him to maneuver the crowds since he wasn’t on his feet but he still did not have to be so hateful. I was able to run the first four miles of the race and I kept at about a 12:30 pace. There was a huge amount of crowd support that really made me take my mind off the distance. This course is by no means flat and the most annoying part of it was that the “hills” were really just inclined but they were soooo long which made it seem like they lasted forever and then the downhill inclines seemed like flatland. We ran past the Governor’s Mansion and he was outside with his wife (and bodyguards) high fiving runners. Several people stopped for photos but I chose not to. It was nice knowing that a man of his political power would be out there encouraging us peasant runners. 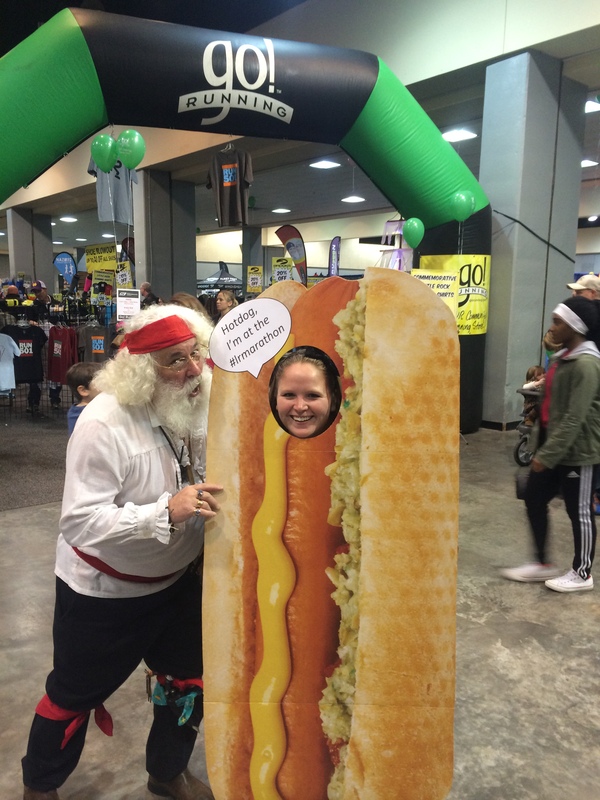 My favorite part of the race was the Couch Potato Mile. This portion was a strip of race that had couches lining the streets on both sides. The volunteers were handing out tater tots, french fries, potato chips, donuts, and beer. They even gave us all a sticker that said Couch Potato Mile. I’ve never seen anything like that before and loved the quirkiness that it gave the race. Throughout the race several people asked me for an arggghhhh matey since I was in a pirate outfit. I was even able to see a friend from back home out on the course who was doing the full. I was completely soaked with rain by the 10 mile mark and walked most of the race from then on. I was able to text my Daddy at each mile marker to let him know where I was at and when to be expecting me. Around mile 12.5 Maybelline beauty cosmetics had a station set up where you could get beads and lip gloss for your finish line photos. I grabbed some beads to put around my neck and placed the lip gloss in my running pack. That was such a cool touch and another unique thing to this race. Finally I could hear the finish line and had it in sight. There were people everywhere cheering and the announcer was booming calling everyone’s name out. I spotted my dad in the crowd and hollered at him so he would know that I was finishing. 2:54:53 was my official finish time and I was elated to be complete with another race. This makes my 7th state completed and my 18th half. The post-race chute was incredibly organized. I was able to get my medal, some food, and my space blanket and then make my way to the reunion area. Oh, and the post race food was “snacks” but they were so delicious and perfect for what I was craving. Chocolate milk and goldfish may not be everyone’s cup of tea but it was just what I needed and wanted in that moment. I was able to locate my dad and then we stopped by the merchandise table and picked up a souvenir shirt since they were marked down to five dollars. Since I had a spectator I chose not to check a bag which made me glad because the bag check line was extremely long. Something to think about if you ever do this race. On the way back to the hotel we stopped by a donut shop and grabbed a bite to eat. Our hotel allowed us an extra two hours to check out which we ended up needing so I was super glad to not have to worry about rushing out the door. Overall this was a great race (despite the weather) that I would recommend to anyone. 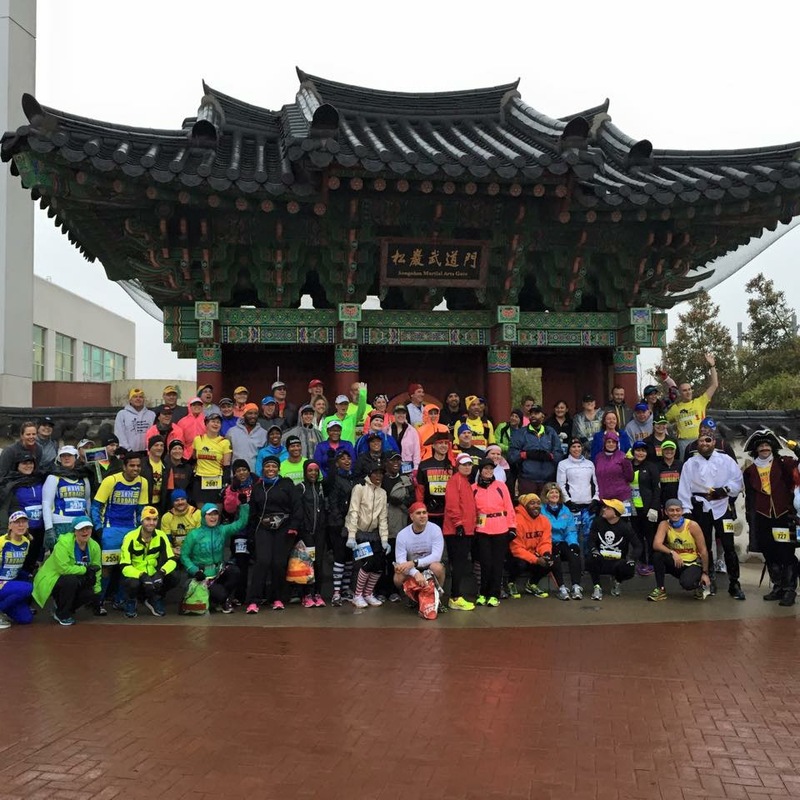 It was well organized, a fun atmosphere, and had lots to offer runners of all capacities. Side note: due to a port strike on the West Coast, finishers medals were stuck at sea. The race directors contacted everyone several days before the race to let us know the situation and even worked hard to get us some plastic medals so that we would have a tangible medal upon finishing. They are mailing all medals at no cost to us so I’ve been very impressed with their professionalism. Do this race, y’all! 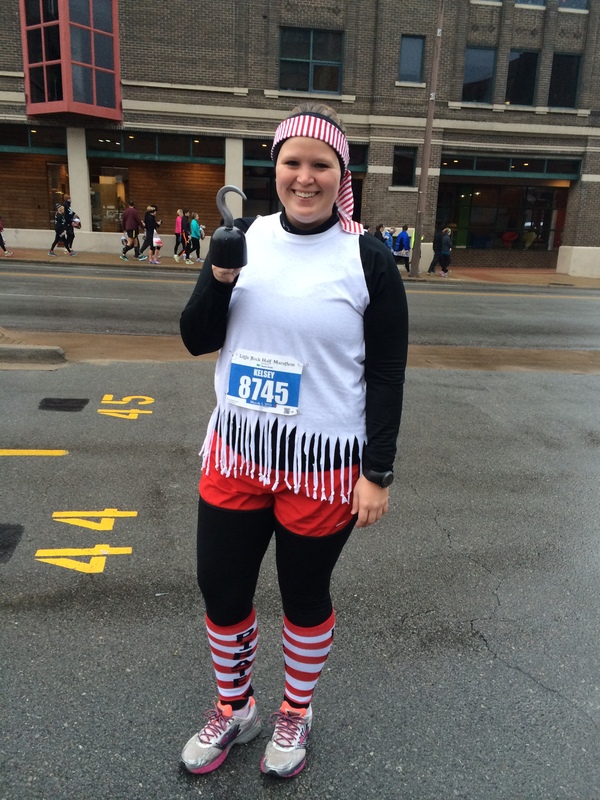 This entry was posted in Race Recaps and tagged little rock marathon, racing all 50, racing the states by thegogirlblog. Bookmark the permalink. Congrats! I have heard great things about Little Rock and it sounds like you had a really awesome experience. Glad to hear that they had a plan for the medal situation. I was very pleased with the medal situation and look forward to it coming in the mail. You should definitely do this race if you ever get the chance! 3 hours is the perfect distance for a quick race trip especially if you have people to go with! You absolutely should do this race if you ever get the chance!! Yes, I had only heard great things as well which is why it was a MUST DO! I would recommend this race to anyone so you should definitely do it if you ever get the chance. Wow! I think I would like to do that race. Thanks for sharing so many great details, and way to go, you! You were probably going so fast you speed demon that you didn’t even notice 🙂 Wish we could have met up and at least taken a picture but I’m sure I’ll see you in Cincy! congrats on a wonderful race!!!! I don’t know how I’m just now reading this but it was so fun to read! 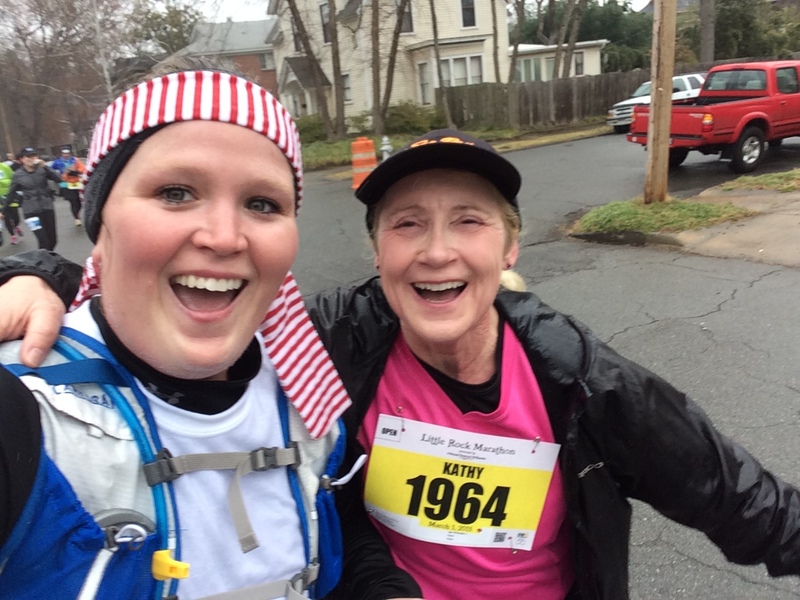 I live in LR and have done the half twice, but didn’t run it this year. I loved reading about your visit to little rock! Also, I didn’t know you could tour the razorback! Ha! We’ve been to parties o n it and had college functions there, but I had no idea you could tour it! How fun! Glad you guys had a great experience here!!!! I’m so glad LR treated you well!! !